To help preserve the environment and utilize the energy stored in natural resources, you can cut down on your external energy costs by switching over to a geothermal pump system. The ambient temperature and energy beneath the earth’s surface, in wells and even in ponds, can be converted into heat pumps that provide both heating and cooling to your home. Quiet performance you can count on. 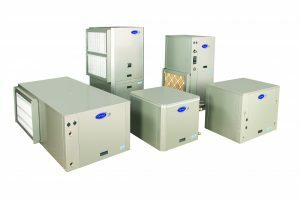 Not only do these systems reduce your carbon footprint, they offer many perks normal heating and cooling units do not. They offer humidity control so you can make your home as comfortable as possible, and the insulated cabinetry and variable fan speeds makes them so quiet, you won’t even hear them! 10 year limited Warranties on all geothermal systems. Currently serving Wilson County and surrounding cities.